Ferocactus wislizeni, the fishhook barrel cactus, also called Arizona barrel cactus, candy barrel cactus, and Southwestern barrel cactus, is a cylindrical barrel-shaped cactus. In adulthood, fishhook barrel cacti generally leans southward, toward the sun, earning it the nickname "compass barrel cactus." One theory about why this happens is, the afternoon sun is so intense it slows the growth on the exposed side, causing the plant to grow unevenly. Many people mistakenly believe that the common sight of a tipped over barrel cactus is due to the cactus falling over from water weight. Actually, barrel cacti fall over because they grow towards the sun, just like any other plant. 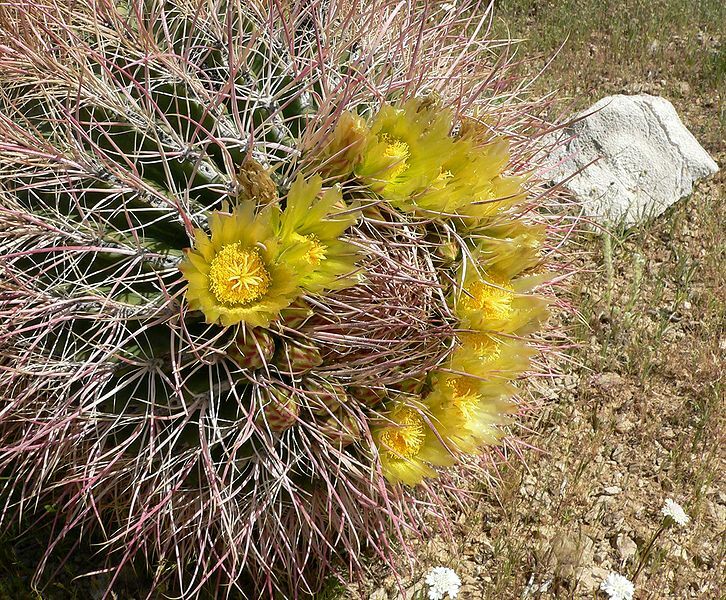 Unlike other plants, however, the barrel cactus usually grows towards the south (to prevent sunburn), hence the name "compass cactus." 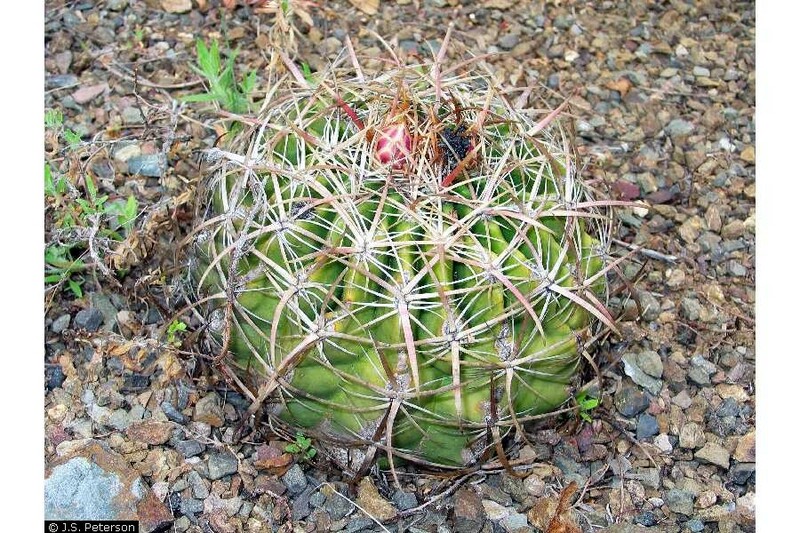 Ferocactus wislizeni (fishhook barrel cactus) is the species that contains palatable liquid; other species, particularly the ones with red flowers, contain oxalic acid, which causes nausea and inability to walk. Presumably the liquid could be boiled before drinking to destroy the oxalic acid. 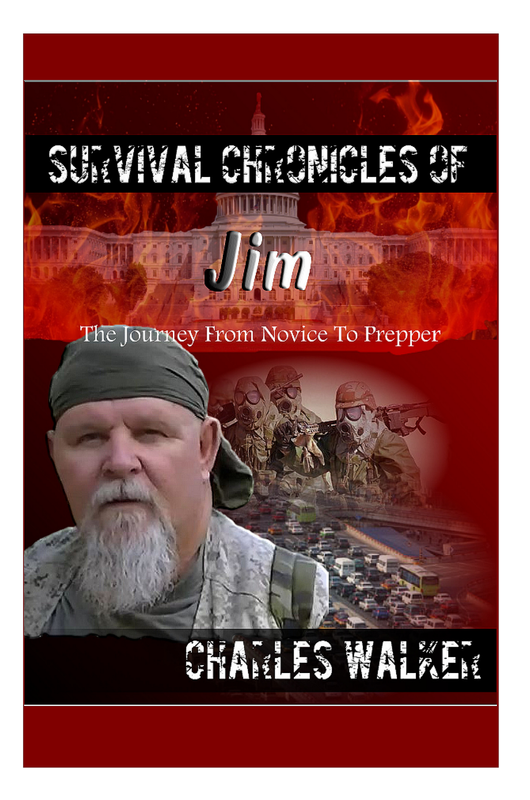 An ax or machete is needed to penetrate the tough exterior. The flowers are pollinated by cactus bees. Mule deer, birds, and javalina eat the fruit. The birds especially like the seeds. The people of the Sonoran desert use the fruit for candy and jelly. The Seri eat the flowers and the O'odham use the fruit, which is sour, as emergency food. 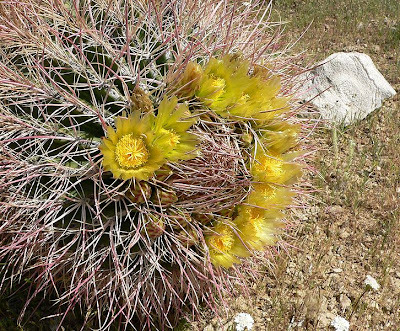 Tradition says that the barrel cactus is a source of water for people lost without water in the desert. 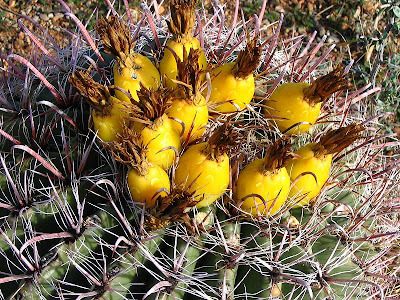 There are records of the southwestern Native Americans using it for that purpose, but the water of some barrel cactus contains oxalic acid and is likely to cause diarrhea if ingested on an empty stomach. Ferocactus cylindraceus is a species of barrel cactus which is known by several common names, including California barrel cactus and miner's compass. This cactus is usually cylindrical or spherical, with some older specimens forming columns two meters in height. It is covered in long, plentiful spines, which are straight and red when new and become curved and gray as they age. It bears bright yellow flowers with red or yellow centers on the side that faces the sun. The fleshy, hollow fruits are yellow. This cactus is native to the Mojave and Sonoran Deserts. The fruit is edible. This plant is especially rich in emergency fluid, used as a substitute for water. 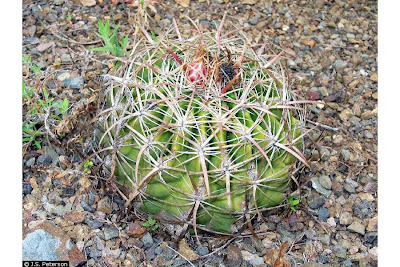 Ferocactus viridescens is NOT a good source of emergency water; the liquid causes upset stomach, diarrhea, aching muscles, and inability to walk. In fact, avoid the tall cactus with red flowers. It can cause temporary paralysis, and has also caused bloody nose, red eyes, and burning urine. The Comcaac said the juice of this cactus is not potable, and that eating the pulp causes headaches. Be careful of any plant located in Comcaac territory.